← Christmas Tree Cake … not so perfect! 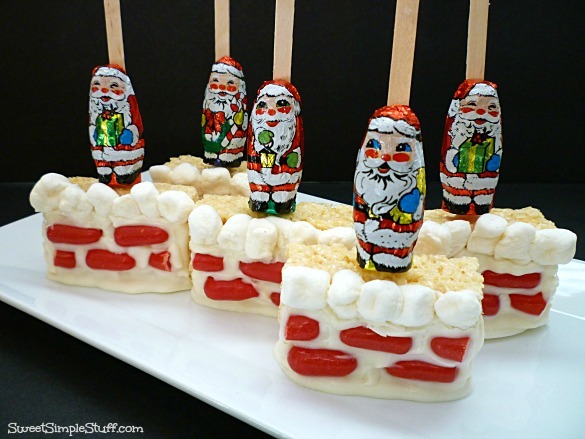 Santa Is Coming Down Your Chimney Tonight … Pops! I’m going to make short and sweet … Christmas is around the corner! Line a tray with parchment or wax paper. Melt CandiQuik according to package directions. 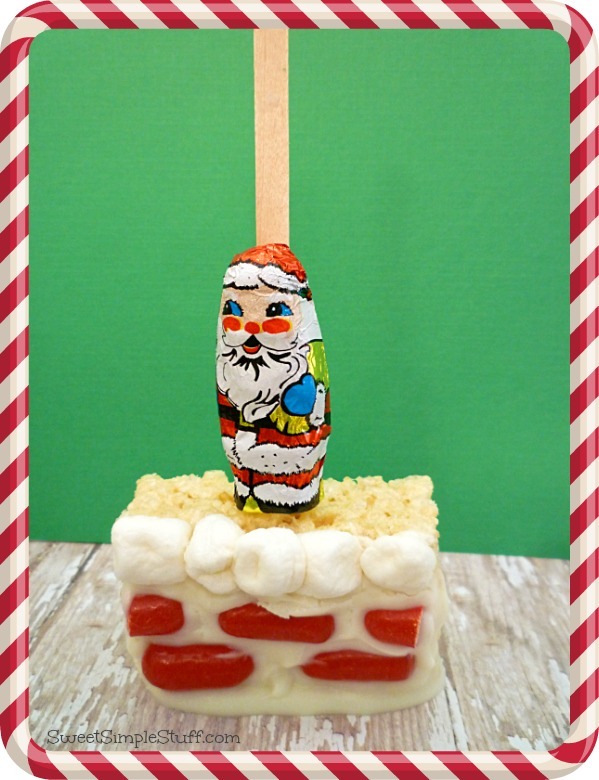 Dip the tip of the stick in melted candy and insert into Rice Krispie Treat. Place 5 or 6 mini marshmallows along top edge and smash a little to make snow. Use Hot Tamales to make bricks on chimney and press a little. If you are not a fan of Hot Tamales, I saw Mike & Ike’s in holiday colors or use red licorice pieces. Put about 1/2 cup melted candy in squeeze bottle or pastry bag. This will be the mortar for the bricks. Fill the areas between the bricks. Attach Santa to the stick. I used just a dot of glue (from a glue gun) on the foil. Tape may be another option. 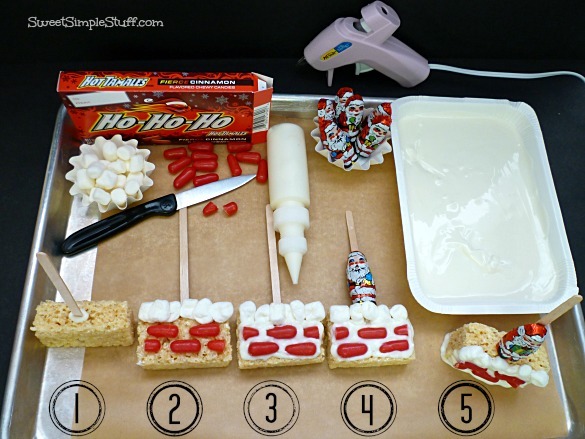 Dip the bottom of the Rice Krispie Treat in melted candy and stand on prepared tray. Let candy harden at room temperature or chill for a few minutes. Glad you posted it! LOVE IT! Ah, these are adorable. So glad that you had decided to post once again. Thank you. Thank you for sharing this with us. I know several people with children as well as some with grandchildren as well as great granddaughter children.So yes I will be sharing this with them. Thank you so much for sharing Anna 🙂 My 23 year old niece really liked them … she took two … I guess that you don’t have to be a kid to like Santa! You’re so inventive. Santa coming down the chimney – very clever. For the Floridians without a chimney, this is perfect. 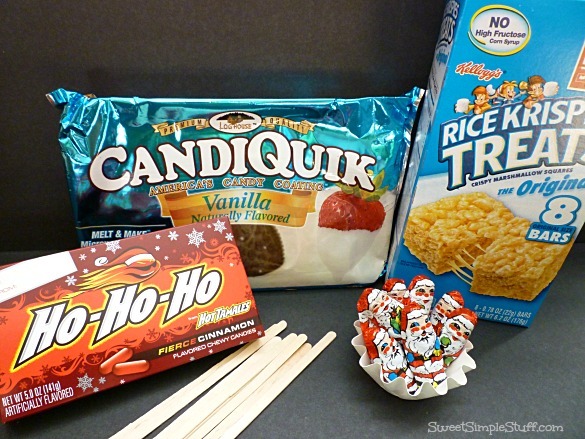 All done with pre-made candy – genius. We have a brick chimney, so these will be cute coming from us. Thanks. 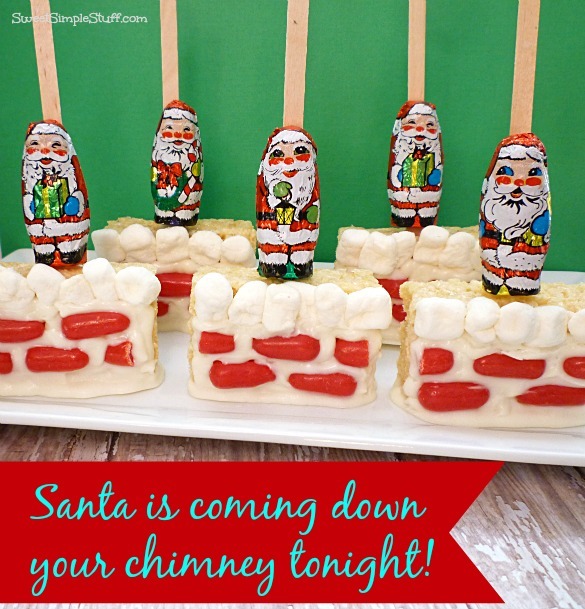 Thank you Tavette 😉 I think that you should make them … since you have a chimney and all! How DO you think of these things? Very cute! Ha! Love these! I agree with the above comment, HOW are you so creative? I need your brain some days…lol. Thank you Sarah 😉 I could use your brain some days 🙂 … maybe we can swap!